There are few things that irritate me as much as people that refuse to pick up after their dogs. It is International Pooper Scooper Week and I am once again climbing on my soapbox to preach to the choir. I say that because I feel sure that most of my readers are responsible pet parents who always pick up after their dogs. Since this is the case, please feel free to print this post out and share it with those who are shirking their doodie duty. 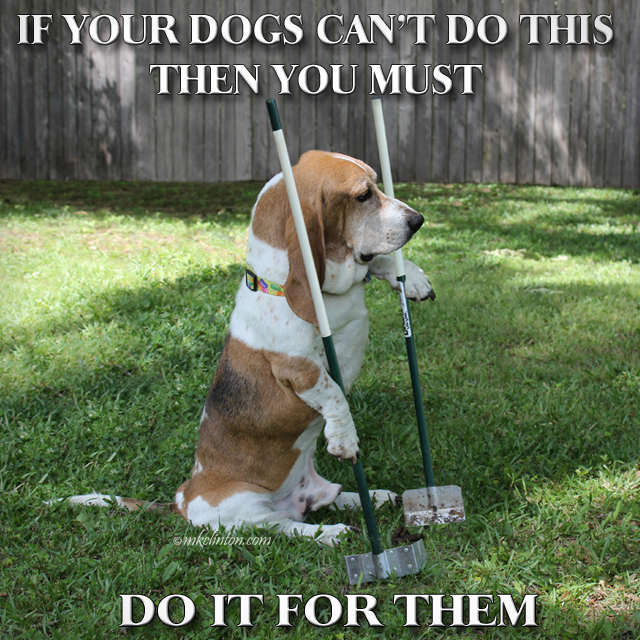 There is NO excuse for not picking up your dog’s doo. It is just that simple. It’s your dog and unless they can clean up after themselves, the job lands squarely at your feet. Bend down and put it in a dog waste bag. If you don’t have doggie bags, use a grocery store bag, a bread bag or anything you can carry. Don’t walk away and leave it. Dog poop is not just gross, it is a public health issue. Left on the ground, feces can expose humans to E. coli, salmonella and roundworms. Dogs are at risk of also catching coronavirus and parvovirus. It attracts bugs and parasites too. Not picking up your pup’s poop can literally make you sick. If you are counting on the rain to wash it away, remember that poop is making its way to a waterway near you. In addition to contaminating lakes and streams, dog waste adds nitrogen to the water which in turn depletes the oxygen needed for underwater grasses, wildlife, and fish. People that let their dogs out to take care of their business in someone else’s yard are jerks not being good neighbors. Seriously, would you allow your child to go use the bathroom on someone’s front lawn? Let’s hope not. The same etiquette should hold true for dogs. Let’s be clear about dogs and their poop. It happens. A lot. The average dog poos about ¾ of a pound daily. That adds up to about 274 lbs. annually. It is estimated that only 40% of dog owners pick up after their dog. Y’all, that is an astounding amount of crap on the ground, in our water systems and being tracked indoors on shoes. I don’t know anyone who is excited about picking up a warm steaming pile of poo. It is yucky and it stinks. It is also part of being a responsible pet parent. You don’t have to like…you just have to do it. *I am now stepping down from my soapbox and hope I don’t step in any unscooped poop! Pooper Scoopers make picking up after your pup easy! We couldn't agree with you more, Miss Melissa! Thank you! We always go on our walks and Mom always picks up after us. It's so easy to do! Agree 100%! The worst is when the snow melts and exposes a bunch of poop that people left behind. I guess they think the snow will make it disappear. So gross. People who don't clean up after their dog makes it hard for the rest of us. Is there a bit of room on your soapbox? I'm working on a post now because as the weather has become more spring like, the fair weather walkers have come out and a noticeable number of them seem to suffer from amnesia about picking up after their pet. Grr. We agree! We carry extra bags too - can never be too prepared! Lol! Is there room on that soap box for Mom!!?? She used to walk our neighbor's dog and ALWAYS took a poop bag...but OMCs the messes she saw along the way. We agree with you on this one. Our neighbors' dog (who has since passed away) would poop in our yard all the time. Now honestly, it bothered the mom but given that our neighbors are in their 90s, the mom never said anything to them. And just scooped the poop herself. But people should look after their dogs and what they leave behind. Da worst are da peeps who leave da poop on da sidewalk!! Da grass are bad enuf, but da sidewalk are SUPER GROSS. BOL! & Barking Right On! One day with our first dog, a million years ago, we were on a walk and he pooped and I reached into my pocket and I didn't have a bag. I AMA good dog owner but I wasn't picking it up with my hand. A quick search on the area showed a discarded cup from DQ, so I used that! Nows, i wish I was as talented as you Bentley! I gots to have Ma pick up my poops, and she loves it so much, she double bags it! (something abouts stinky poopie...whatevs) Just today, we saw dog poopies all around from peeps that didn't do the right thing! (Ma picked up a few, butts ran outta bags!!!) Anyhu, FABulous postie! This is Such a great post, the facts are the only thing that will get some peoples' attention. I don't know why there are so many selfish, careless people with dogs out there. I'd love to tack this up in our 'hood. Thanks for sharing! One nice thing about living in a quiet rural area and mostly walking on our own quiet road and in our woods, is that we won't have to deal with those inconsiderate people. Now if I could just get the deer to pick up after themselves, we'd be good. LOL!